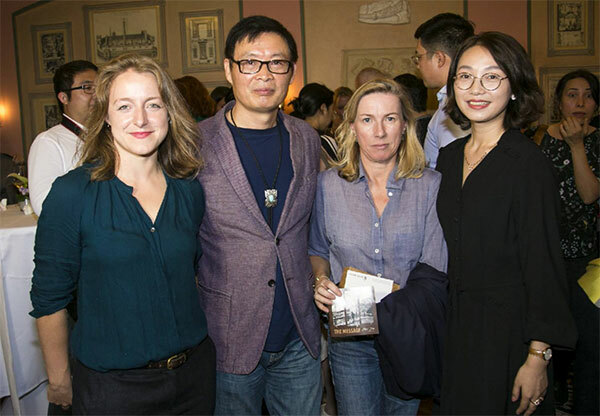 It's the first time a Chinese author is featured at such a themed event during the Frankfurt Book Fair, signaling wider interest in Chinese original storytelling. More than 100 publishers from 20 countries interested in copyright cooperation on his books attended the event. Mai Jia's Decoded, a page-turning story about an orphaned math genius devoted to cryptography and deciphering, first took the world with its Spanish version published by Planeta. The English version was published in 2014 by Penguin and was called one of "the 20 best spy novels of all time" by The Daily Telegraph. Its copyright was sold in 33 languages worldwide. Alongside the success of the English version of In the Dark, another of his spy novels, what was focused at the author's night is his third book from the Trilogy, The Message. The Message generated keen interest in foreign publishers. "Basically, it's 'escaping from a secret room' like story that happened in the 1940s," Mai Jia said. Four people are trapped in a secret room, with one of them an agent undercover for the Communist Party and he/she has an important message to send out. Head of Zeus, the British publisher of Liu Cixin's Three Body trilogy, bought the right to the English version. A deal was also signed that night to sell the novel in the Italian, Portuguese, Turkish, and Finnish markets. Olivia Milburn, the English translator of Mai Jia's trilogy, said: "Decoded and In the Dark are one kind of book; The Message is different—it is a crime story in which all the witnesses are lying...it is a puzzle story, and readers will enjoy trying to discover what has happened." Literary agent Tan Guanglei said Mai Jia's works appeal greatly to foreign readers with the kinds of stories they are familiar with and would love to read, but in some sense it's also so unique and different.